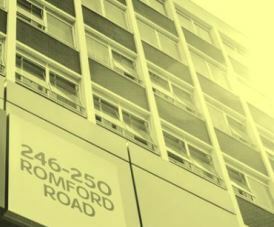 Romford Road Business Centre offers a wide choice of office suites that can be let on flexible contracts. With affordable prices available, these office rentals are fully furnished with desks, chairs, and storage cabinets for each member of staff. There are a number of meeting rooms within the building and can be hired as and when needed. These include conferencing and boardroom suites that can be booked via the main reception. Transport systems for the local are good with a train station close by that has direct links to DLR services. Parking for cars and vehicles is also within the complex. Broadband and telephone packages for each serviced office is supplied and digital handsets with call messaging are provided free of charge. There is also an IT support available to route all systems to a preferred configuration.